This entry was posted on January 6, 2014 by Tintean Editorial Team/fdg, in Book review and tagged Irish Literature, McBride, women Ireland. Bookmark the permalink. 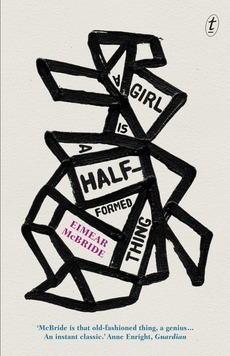 Eimear McBride: A Girl Is A Half-Formed Thing, Text Publishing, 2013.
to celebrate the qualities of creative daring … and to reward fiction that breaks the mould or opens up new possibilities for the novel form. … already an outsider in the village where she finds herself growing up, she becomes further alienated from those around her by her mother’s evangelical Catholicism, the schoolyard bullying of her brother and, after a sexual experience with an older family member, her own increasingly chaotic sexuality. ‘pre-consciousness’ because it is situated back at an earlier point, just before thought becomes formative. The raw, authentic voice may have been influenced by Mc Bride’s theatrical studies, but her theatrical ambitions were put aside in favour of writing after the death of her brother as the result of a long battle with cancer. Not there, I walked around and around. That house had up hill and down dale. Steps and mud. Those wellies red. Umbrella. Wondrous being dry. See fat drops plop and runlike a river down for flies. Spiders. I went in. I knelt next to by your bed. I put my face in the hook of your left arm. I said please please you help me. I thought. I knew. You’re dying soon. I wished for you. All be very good. Your life was better that it been I said I love you. Please tell me you love me. You sleep. Ah Mammy sorry. Sorry. Please all you say. She have you by the jumper. Slap you harder. Slap and slap and slap. Push you in the corner. Mammy. Mammy. Getting red face. Getting sore face. Slap again she. She again. Screaming. You imbecile. You stupid. I cupping all my blood nose in my jumper. Carried up to the graveyard and lowered him down. Throw a rose on top. His daughters. More at him than on. Rub their shoulders sons-in-law. He’s buried. Under the muck. The end. Go on there get in your hole. Amen. And. Amen. I’m dancing, dancing, twirl my head. On the bar in my slip shoes. …Kick of that glass. Kick that one. Into the wall…. There is a disturbing escalation of sadomasochistic activity which will confront many readers, early on: ‘Some hurt me with nails on my face.’ Later, she urges men to punch her. For a moment, toward the end of the novel, the use of capital letters within words highlights the acute intensity of brutality of her sexual encounters and forced me to scrunch my eyes shut to block out the pain and fear, while paradoxically compelled to force my shutters open and read on. This novel is inspiring in terms of its original narrative voice, devastating in its depictions of the brutal consequences of social and cultural paradigms that restrict the role of women, yet ironically, a celebration for the compassion it ignites in the reader. I am delighted and excited to read that McBride is working on a second novel. Andi is a Melbourne-based teacher of Literature.